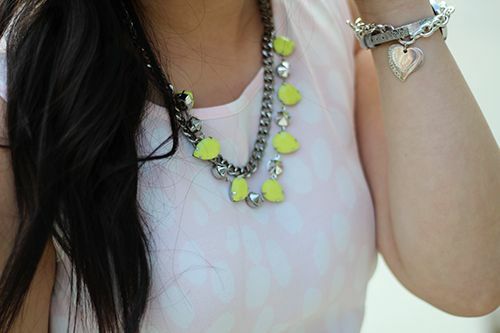 When the sun is out, I love to wear colour, and I've always had a soft spot for pastels. In fact, my room is actually mint green, and mint is one of my go-to shades. When I first saw this peplum top, I was in love with the zipper in the back. So cute - but I neglected the material, and it bunches up and creases within seconds. Whoops. Anyway, I like to balance the full peplum with a sleek bottom. So pencil skirts & skinny jeans always look great with this popular top. 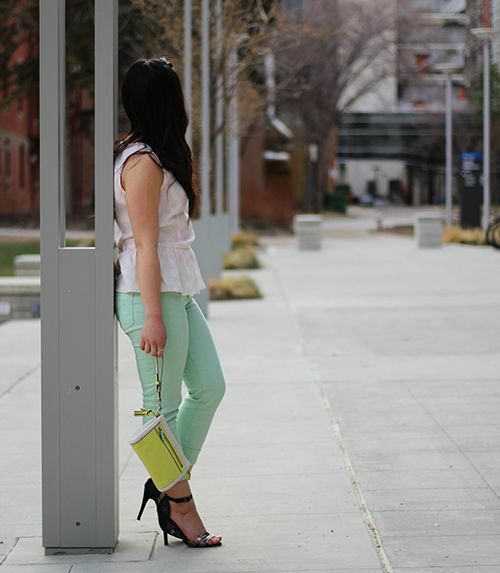 How do you like to wear your peplum? Haaaapy Monday! After a weekend of grey skies and rain, I cannot wait for the sun to come out and shine this week. It's been a busy weekend for me, but I hope you've all had the chance to relax, and to my American readers, hope you had a great Memorial Day weekend! Today for Mani Monday I have something a little different to share with you all. 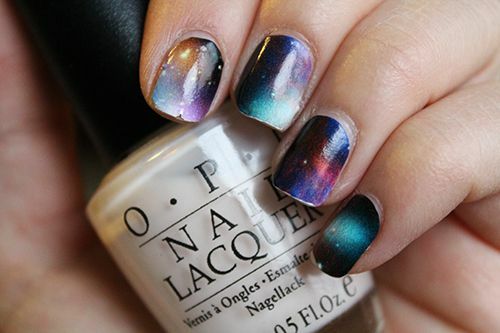 Have you ever seen those tutorials for galaxy-inspired nails and thought they were absolutely beautiful? Cause I have. But I'm an incredibly busy person without time to spare, so sitting down and using multiple polishes to achieve the look is out of the question for me. 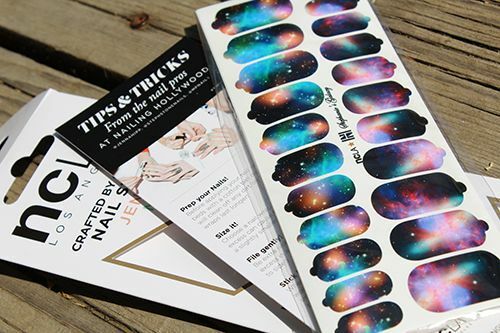 Enter NCLA's nail wraps. When I first laid my eyes on these nail wraps, I couldn't help but think how beautiful the print was. I love the idea of nail wraps for complex designs, because not only does it look perfect on the nail, but it lasts for so long. 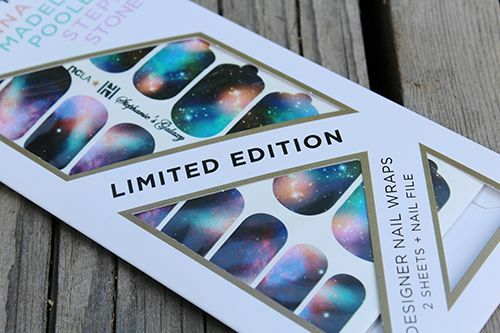 Each package of nail wraps by NCLA comes with 44 different sized stickers, which could realistically give you 4 manicures if you're willing to trim down the bigger pieces. There is also a set of directions and a nail file to help you with application. Having only used nail strips once before, these ones were a little stiffer than my previous set, but they were still very easy to apply and finish off with a top coat for enhanced wearability and shine. I decided to test out the wear on these nail wraps, and on day 6 of wear pictured above, you can see the minor tip wear and small chips on my index and pinky finger. 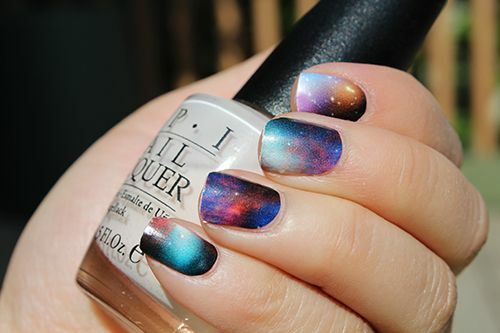 I thought it was amazing to see the design wear so well and for so long on my nails. But I do have some cons - wearing wraps on your nails means that you nails are unable to breathe. Removal was super simple, but I found that the nail wraps did remove and damage the upper layers of my nails. This is a problem on my part, seeing as I neglected to put on a clear base coat before application as stated in the instructions. Whoops. It was an easy fix for me to take a buffer to smooth everything out and recondition my nails with cuticle oil to restore their original condition, so make sure to protect your nails before application. Secondly, a majority of the nail wraps were too big for my fingers, so if I wanted to utilize the full package, I would have to trim down the larger sizes for future applications. So whats the verdict? I think the NCLA nail wraps are an awesome product - they've got great designs and I'm sure they could wear up to a full 8-10 days without much of a problem. They're available via Nail Polish Canada for $16 and ship for free. If you were to do 4 manicures, that works out to $4/mani, which really is a great deal when you compare it to other brands offering nail wraps for upwards of $8. 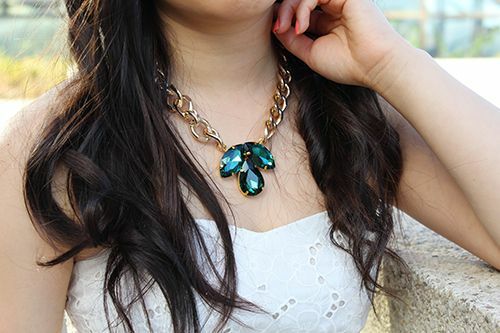 I'm particularly fond of these three (1,2,3) styles, and I have one more set to share with you soon! Have you tried any of the NCLA nail wraps? How did they turn out for you? Disclaimer: This product was sent to me by Nail Polish Canada for consideration of a review. This post is 100% my opinion, and as always, my priority is to you, the reader, to present an unbiased, thorough review. On my quick trip to Banff last month, I had the chance to stop by a restaurant I've been dying to try in Calgary. Finally. I think I've been wanting to make a visit for a couple months now, so finally sitting down in the restaurant was a dream come true. Sad dreams, I know. 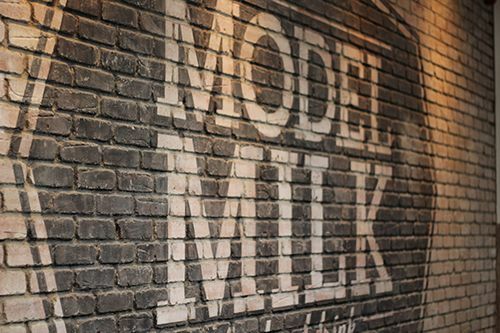 Model Milk was a restaurant I really wanted to visit, mainly for their Sunday Supper. Everytime I've been down in Calgary, I've never been around on Sunday night - so when the opportunity came up, I jumped at the chance. We weren't able to make reservations for early in the evening (5pm), but were assured there should be seats available when the restaurant opened. A majority of the interior of the restaurant is lined with brick and warm wooden accents, while many unique light fixtures are placed throughout. The juxtaposition of classic and modern architecture makes this restaurant really special. I was meeting my friend (Carmen)for dinner, and arriving at 5:15, we were surprised when the waitress informed us that all their walk in tables had already been taken. Apparently there was a big line up before they even opened, so seating at the eating bar were the only seats available. 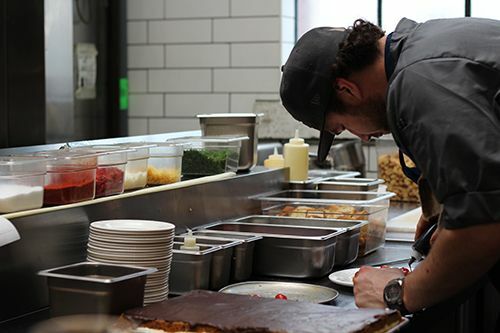 To tell you the truth, I always prefer the eating bar cause you can see all the action and interact with the chefs in the kitchen! 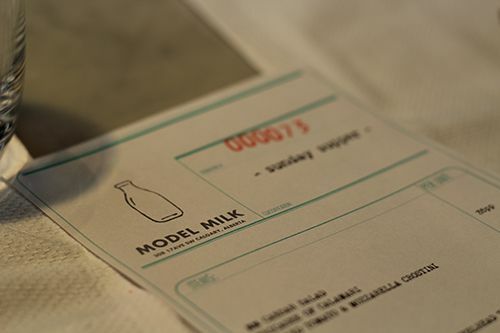 Now, for those of you unfamiliar with Sunday Supper, it happens at Model Milk every Sunday, and it's the only thing you can get - no orders off the regular menu. The menu is preset and different each week, and you get a 3 course meal for $35 per person, drinks excluded. But don't think you're just getting 3 dishes, cause each course consists of a couple different items. So to start off the meal that night, I tried one of their unique non-alcoholic creations, the Blueberry sour ($6): wild blueberry purée, fresh lemon, lavender, ginger, egg whites. The drink itself had a trace of tartness, but it was refreshing and yummy to sip on throughout the meal. There were so many interesting choices both alcoholic and nonalcoholic - I can't wait to be back to try out some more of the unique creations! To start off our meal for the night was the MM Caesar salad served family style, consisting of kale, baby romaine, Caesar dressing and Korean chili powder. 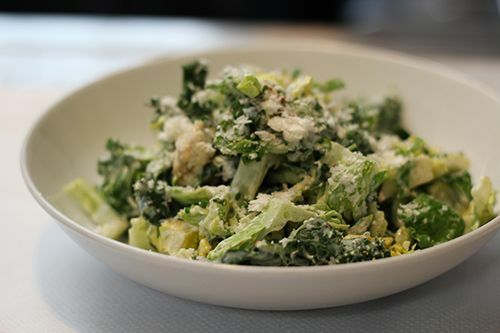 The greens had a satisfying crunch to them, while the salad was garlicky and slightly spicy. Garlic lovers, try this out. Vampires? Beware. Next up was an individual Smoked Tomato & Mozarella Crostini for each person. When I first saw the crostini, it kinda struck me as looking like a beautiful egg. 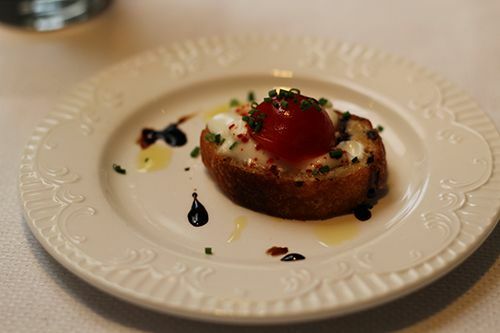 The melted mozarella topped with an intensely red 'liquid' yolk on a crisp crostini had a nice smokiness, while the balsamic countered it with a light sweetness. The last dish to our first course was the Fricasee of Calamari. The calamari was presented in ribbons, served with dehydrated tomato, edamame, and croutons. 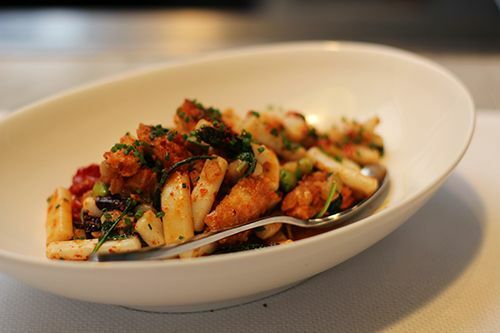 The calamari was tender and easy to chew, and full of salty and spicy flavours. Of all the dishes, this was one of my top picks for the night. Best of all, it's available on their regular menu! 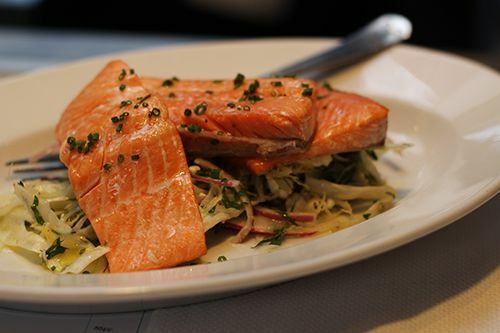 The first dish of the main course to be served up was the Oven Roasted Lois Lake Steelhead Trout served over a mix of onion and fennel. I'm not normally a fish person, but the trout was cooked to perfect, flaking off with each bite. The fish itself wasn't overly seasoned, so the true flavours of the trout were able to shine, and the fennel below added a different element of texture and flavour. This was Carmen's favourite of the night! 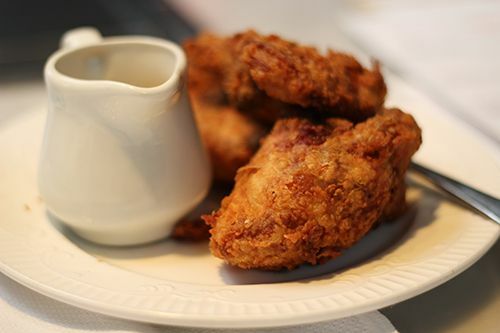 The second feature dish of the main course was Model Milk's Fried Chicken served with pan gravy. The coating of the chicken was nice and crisp (even after sitting for a while), coating the tender, moist chicken on the inside. The gravy was light, giving the dish a bit of depth and moisture when eaten altogether - definitely recommended! Every sunday supper meal comes with four sides with the main course. 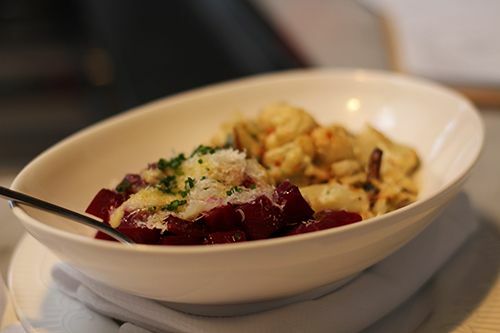 First up was a combination of the Beets Bakey & Roasted Cauliflower with Taleggio. Ever since having beets in a salad at CHARCUT, I've loved beets as a side. The beets kept their form but were easy to bite into, juicy and naturally sweet. The cauliflower on the other hand was creamy and not so cheesy that it felt heavy. 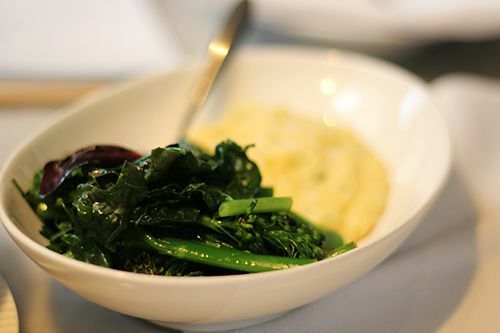 Our other two sides were Sauteed Greens with Sesame and Polenta. As a little girl growing up, I was never exposed to polenta. It was always rice, rice, and more rice. I love seeing it as a side on menus, as I love the creaminess and texture. The polenta cooked up that night was no different, and it was definitely big contrast to the crunchy greens served in the same dish. 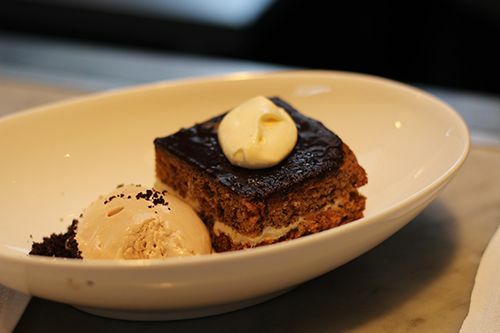 To end off our Sunday Supper meal was a delicious Banana Cake with Housemade Chocolate Ice Cream. The cake itself had a layer of vanilla cream in the middle, and covered with dark chocolate. It was served up warm, moist, gooey, and not too sweet - just the way desserts should be! The ice cream wasn't too rich, and just slightly sweet like the cake. We actually got to see how the chefs make the ice cream too, it was a cool little machine that made small batches at a time. See? So much fun to be had sitting at the eating bar! At $35 per person for a huge, filling meal on a Sunday night.. I have nothing to complain about. The dinner service was well executed and the service was prompt and friendly. The menu for Sunday Supper changes on a weekly basis, but I'm sure you'll love it no matter what is on the menu. Be sure to arrive early, or snag a reservation. Sunday Supper runs each Sunday until 10pm - maybe I'll see you there the next time I'm around in Calgary! I remember when I first started University Da Capo was one of the first "new" restaurants that I went to with my friends. Heck, maybe it actually sparked the beginnings to this blog. Anyway, once Da Capo closed a while back, I wondered what would be replacing it.. luckily, it's replacement Rosso serves up pretty similar fare. 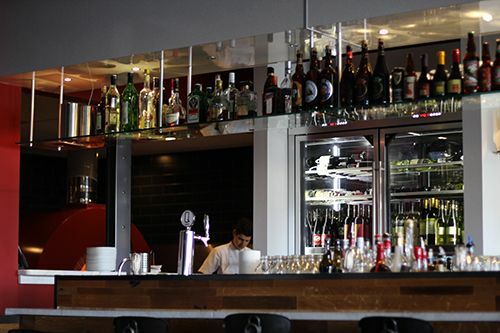 Walking into Rosso Pizzeria, you're greeted with a darker environment - the red walls and warm wooden tables make the restaurant feel more intimate than before. The U-shaped counter still exists in the middle of the restaurant, dividing one side from the other. And to be honest, it's a little high compared to the rest of the tables, as it blocks everyone's view from seeing the newly installed wood-fired pizza oven. Wasn't that oven supposed to be one of the highlights of Da Capo's reinvention? Nonetheless, what is impressive is their array of beer and wine available. A vast display decorates the top of the bar, and there is so much variety to choose from. Pizza and beer... a perfect combination in the eyes of many, right? 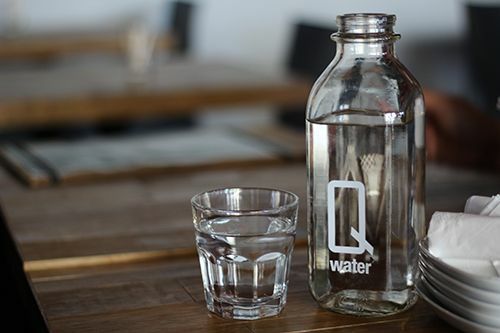 But if you're not in the mood for drinks, Rosso does have the Q water system installed, and serves the water free of charge. 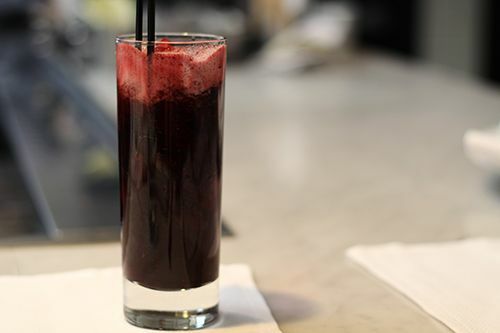 If the drink list isn't overwhelming for you, the number of food choices available is comparable to the drink list! Our table spent a good amount of time looking through the choices on the menu, and it was tough to narrow it down because a lot of the food sounded great. I will have to mention that you do have to have a fairly good grasp on your Italian food words, as a majority of the menu uses Italian to describe the ingredients. 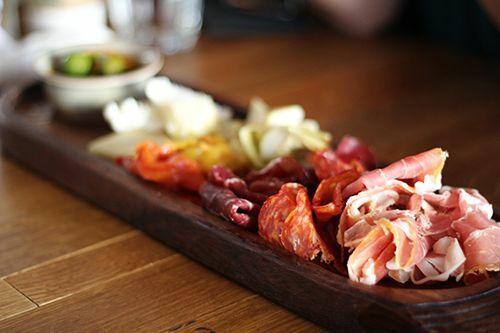 We started out the meal with the Antipasto Misto ($15): cured meats, assorted cheese, olives, artichoke hearts & roasted peppers. On our board we had prosciutto, and two types of salami. The selection and proportion of charcuterie meats to bread was perfect, and combined with the fresh, mild cheese, this was a nice dish to start off the meal before diving into the pizzas. 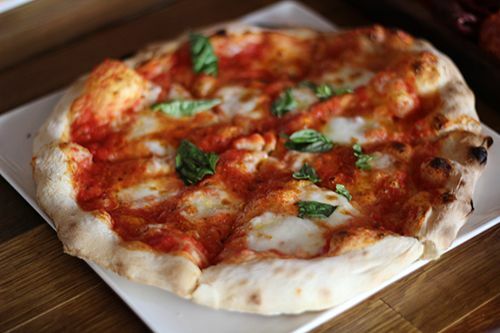 My personal choice for the meal was the Margherita Pizza ($13): san marzano tomato, fior di latte, fresh basil, because I feel that a good Margherita pizza can tell you a lot about the restaurant. It's a simple pizza that you really shouldn't be able to mess up. The red sauce was thin, which helped ensure the pizza wasn't too soggy in the middle. With little bits of cheese here and there and a sprinkle of basil, this was a simple, tasty pizza. 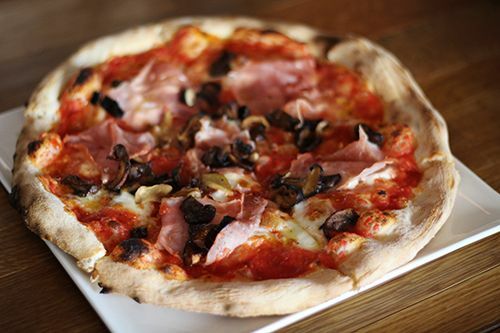 Next up was the Prosciutto Cotto Pizza ($15): san marzano tomato, fior di latte, cotto, mushrooms. The ingredients were heavier on this than the margherita, and the mushrooms added extra moisture, making this pizza soggier in the middle. However, I did like the combination of ingredients, as the prosciutto wasn't overly salty. For all the red sauce pizzas, you can upgrade the mozzarella for buffalo mozzarella for an additional $3, which I don't feel is entirely necessary, but to each their own. 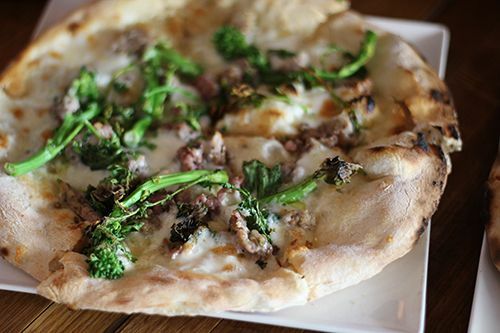 Lastly, we finished with a white sauce pizza, the Rappini E Salsiccia ($16): fior di latte, rappini, local fennel sausage, robiola. I typically don't enjoy pizza bianca, but this one wasn't bad. I really enjoyed the stronger flavour of the fennel sausage, and despite having the unique texture of the rappini, it was a little stringy and hard to chew. The pizza dough was cooked nicely though, as it had a soft texture and wasn't overly dry. 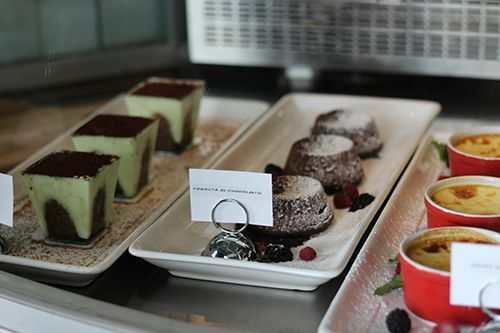 For dessert, we took a peak into their case of gelato and were faced with a ton of different options. From mascarpone to mayan chocolate, I settled for something really different - halva. Halva is actually a dense, sweet dessert typically found in the middle east, but in the gelato form at Rosso, it was a sesame seed gelato. The smooth, creamy dessert was studded with sesame seeds and had a light sweetness to it. It was the perfect sweet finish to the meal. 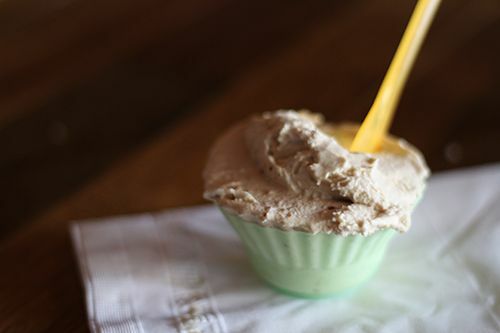 But if gelato isn't your thing, Rosso offers up choices like custard and tiramisu for your sweet tooth. 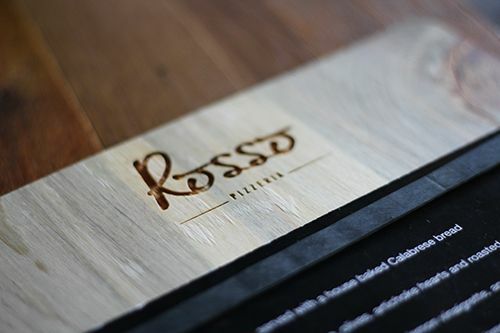 Being close to the university campus, Rosso is a great spot for a quick dinner with friends after class. The pizzas here at Rosso remind me of those from Famoso. Thin crust in the middle with puffy, crisp dough on the outer edges. The pizzas cool quickly and have the tendency to become soggy fairly quickly, so I would recommend trying to stagger your orders for pizzas, or request to have them come out at different times. Try it out and let me know what you think! May long weekend! Hope you're all having an awesome Monday so far - it's a holiday where I am, so I get to have today off to... catch up on all the homework I probably should've done a couple days ago. Whoops! Can't blame me though - the weather here has been absolutely gorgeous and I've been spending lots of time sitting out on patios just enjoying the act of doing nothing. 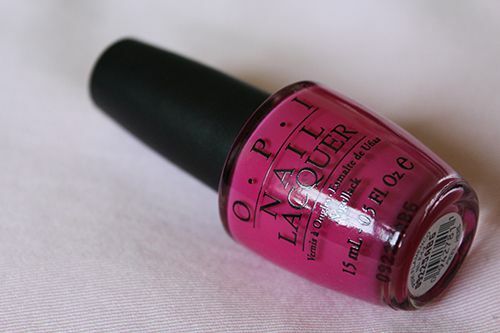 This week on my nails, I've got another classic OPI shade that reminds me of summer. Pink Flamenco is actually from the 2009 Fall collection, but its another one of those polishes I love the use over and over again. 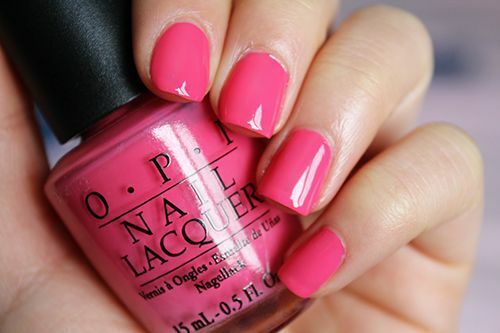 This polish is a hot pink with a strong blue tone in it, making it more of a bright purple-pink shade. The formula is smooth and full opaque in two thin coats - it dries to a gorgeous shine and levels itself out beautifully. I was able to wear it for 3 full days before signs of tip wear started to show - something to keep in mind if you don't like to change your polishes frequently! I have a lot of things to be thankful for. The past couple months my life have been a whirlwind adventure - with school, family, jobs, etc. But one thing has kept me mostly sane - and that is this blog here! I need to say a big thank you to all of you that support me in this blogging journey, because so many great things have come my way. I've been able to connect with countless individuals throughout the world, and locally the support has been amazing. For those of you that are unaware, a couple months ago, I was shortlisted with a nomination for Yeggie - an award recognizing social media in Edmonton. I was nominated for Best in Food - and although I didn't win the award, it was a honor just being nominated with all the other deserving individuals. 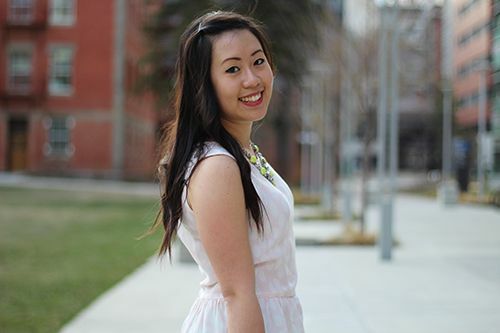 So with this post, I thought it would be suitable to share with you what I wore on the night of the awards banquet. Who knows where this adventure is going to take me next? All I can say is that I will continue to work hard and be thankful for everything I'm given. So thankyou, thankyou, thankyou - I cannot thank you all enough for being here on this journey with me. This past Mother's Day, I had the chance to preview the food that will be available from a new food truck here in the city this summer. SWICH food truck is going to be hitting the streets soon, and they're pretty impressive - they make everything from scratch! Literally everything. Bread, meat and spreads. The lunch time pop-up event at Lan's Asian Grill was a great way to introduce some of their artisan sandwiches that will be available. 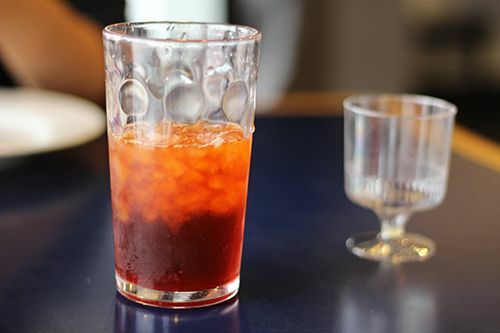 With three planned sandwiches and dessert planned, the SWICH team started off the meal with mimosas and Bourbon Thai Tea. First up was the Thai Ham Sandwich. Ham cured with lemongrass, kefir lime leaves, and fish sauce, shaved and topped on a fresh baked hoagie with tamarind mustard and a tomato. The enjoyed that the hoagie had a slight chew to it, but the star here was the ham. 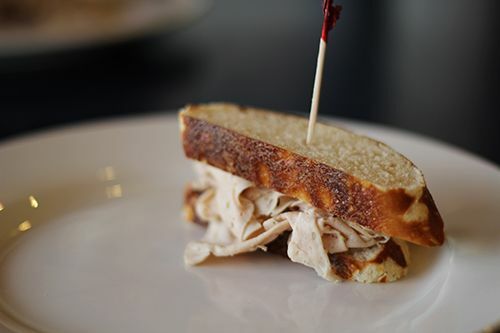 It was so tender and easy to bite into - not to mention the mix of flavours used in the brine marinated the ham perfectly and it wasn't overly salty. I would eat this ham all day. Next up was the Thai Green Curry Chicken Sandwich, which was hands down my favourite of everything I tried that day. Between two slices of pillow soft pretzel bread was a smooth green curry deli chicken, pickled bamboo and green curry aioli. Seriously a huge flavour explosion with every bite - I'm not a green curry fan, but I loved this sandwich. Every part of it! 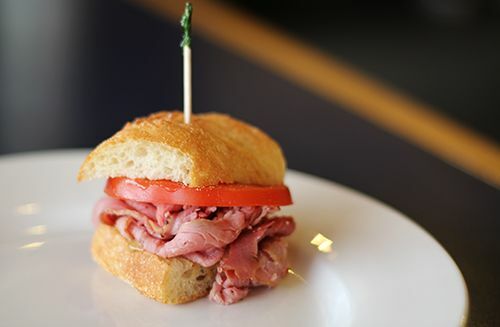 The last savory sandwich for the meal was a Montreal Smoked Wagyu Beef sandwich. There's now a producer in Southern Alberta that produces Wagyu, a smooth marbled beef, and SWICH is proud to be the only truck in Edmonton to serve it! 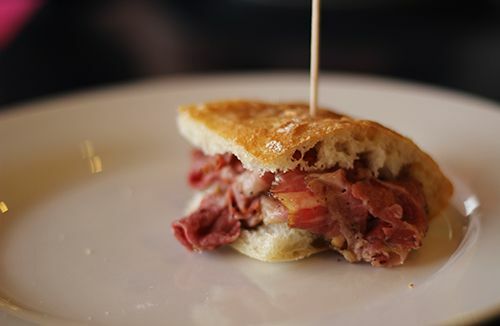 After being cured, brined and smoked, the beef is shaved thin and served with a sauerkraut aioli and dry roasted red cabbage inside a ciabatta bun. The sauerkraut flavour was light, and each bite into the slightly chewy bun yielded a certain creaminess to it from the beef. The smokiness was apparent, but not overwhelming. Dessert for the meal continued on with the sandwich theme with an ice cream sandwich. 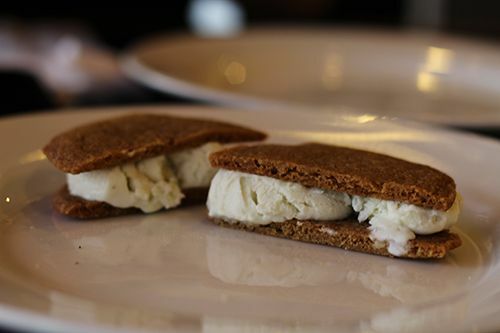 Lemongrass ice cream slathered between two ginger cookies - I was a little hesitant upon hearing we had lemongrass ice cream, but this match was actually perfect! The ginger cookies had a bold ginger flavour as they are made with fresh ginger juice, and had crispy edges and a soft middle. The combination was sweet and spicy, and a really great palate cleanser for the end of the meal. I can't wait to see what other dessert sandwiches they have in store! After the SWICH popup experience, I cannot wait for their truck to hit the streets. They should be out by the end of May, with a lot of potential locations that they'll be disclosing in the near future. It's pretty impressive that they make everything from scratch.. That's a lot of dedication and hard work. Once the truck is out and about, make sure to give them a try. They'll impress you and your taste buds will thank me! Happy Monday! The sun is shining, I had a great weekend, I can't ask for more! Hope everyone (especially the moms out there!) had an enjoyable weekend! This week I have one of my favourite nail polish shades of all time to share with you! 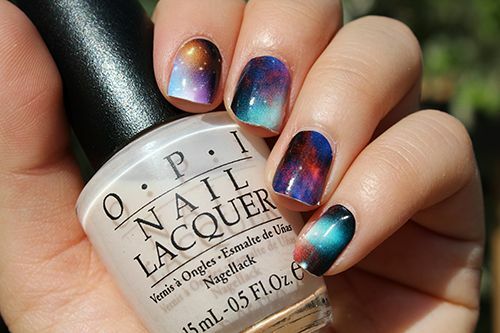 OPI's Feelin' Hot Hot Hot! It's a high gloss pink shade that's bright enough to grab attention, but still subdued enough to be work appropriate. It's always been one of those go-to shades I love to wear in the summer, whether on my fingers or toes, cause it just screams warm weather and delicious (boozy) drinks in the sun! The formula is wonderful - easy to apply and levels out in just two coats. Best of all, it's part of the permanent collection so it can't be hard to find! Ever find yourself going back to one certain shade all the time? Let me know what yours is!